Two days after the Eclipse Awards winners are announced at Gulfstream Park, the Hallandale Beach, Fla., track’s Pegasus World Cup Series could kick into gear this year’s championship races. 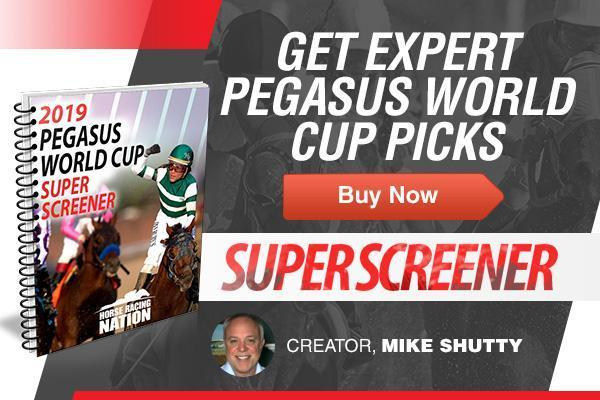 In addition to the third running of the Grade 1, $9 million Pegasus World Cup Invitational, carded Saturday is the Grade 1, $7 million Pegasus World Cup Turf on an afternoon including seven other stakes. This all begs for some predictions — bold ones. In their last meeting at this distance, City of Light came away the narrow winner over Horse of the Year finalist and Breeders’ Cup Classic winner Accelerate. This weekend, I think we will see Breeders’ Cup Dirt Mile hero City of Light show not only show that he is the better horse at this distance, but that he has maintained his form as Accelerate lost a step. In their final works, Accelerate left quite a bit to be desired, in my opinion. The five-furlong drill in :58.80 was indeed fast. However, it appeared that Accelerate began to slow in the stretch, and that the rider had to keep after him a bit. City of Light, on the other hand, looked within himself when working a half mile in :47.26, a bullet over the Gulfstream strip. City of Light could very well be coming into the Pegasus the better of the two, who will both head to Lane’s End Farm to begin their second careers immediately. Considering that, and the cut back to 1 1/8 miles for Accelerate, I believe City of Light has the edge here. Much was made of the disappointment in Audible’s flat second-place finish in the Harlan’s Holiday Stakes (G3) at Gulfstream Park last month, with suggestions that the colt was past his peak, or simply part of a mediocre 3-year-old crop. But Audible had his excuses. The Harlan’s Holiday was run over a sealed, sloppy track — one that was an odd mix of wet and dry. Plus, you could argue he didn’t take that well to an off track in the Kentucky Derby despite a third-place finish. The chart notes that the final quarter was run in :26.85, so in retrospect he really wasn’t closing that strongly. He was made to look good by passing tired horses, and nearly beat Good Magic, who was noticeably weary in deep stretch, for second. In Harlan’s Holiday, Audible also had to close into a dawdling pace after caught wide around both turns. The winner, on the other hand, rode the rail nearly the entire way. Currently, the forecast shows 40 percent chance of rain for Saturday, so the track condition could play a part in Audible’s potential rebound. Patternrecognition and City of Light will both want the lead in this race and figure to set a fair pace. I expect to see Audible finish with a flourish. While Aztec Sense is riding an eight-race win streak into Saturday’s Grade 3 stakes on the Pegasus undercard, it’s still possible he doesn’t go off as the favorite facing a jump in class. The Fred W. Hooper represents Aztec Sense’s first attempt at graded stakes company, and there he will meet a number of runners who have already been there and done that even with 9-5 morning line favorite Coal Front expected to scratch. The same connections campaign Copper Town, who’s expected to stay in the field. Pacific Gale doesn’t measure on on paper in the Hurricane Bertie (G3), not with Breeders’ Cup Filly & Mare Sprint winner Shamrock Rose in the field for her 2019 debut. Then add to the equation Blamed and Dream Pauline, both of whom won their last starts impressively. However, Pacific Gale’s competition is precisely the reason I think the 20-1 shot has a chance here. Both Blamed and Dream Pauline are going to want the lead and could wind up burning one another out. Pacific Gale should be in perfect striking distance once those two begin to tire, and her next threat will come from Shamrock Rose, who should wind up from off the pace. I’m banking on jockey John Velazquez having the daughter of Flat Out placed well enough to fend off the champ’s late drive. The Breeders’ Cup Turf Sprint featured one of the best stretch duels of the weekend last November when the then-3-year-old World of Trouble flew to the lead to set head spinning fractions, only to get nailed by a neck by the defending champ, Stormy Liberal. I expect the tables to turn when they meet again in Saturday’s Gulfstream Park Turf Sprint. When the two last met, Stormy Liberal won his first race outside of California, then running at Churchill Downs. Aside from that victory, he’s 4: 0-1-0 when leaving trainer Peter Miller’s base. This time around, the race is in World of Trouble’s backyard, and the newly turned 4-year-old opened his season with a win while cantering home at Tampa Bay Downs. Stormy Liberal’s connections will use this as a Dubai World Cup night prep. Perhaps their champ will be a bit short.